Hockey Plumber: Why Is It Always Bettman's Fault? The refs missed a call that would have given your team a power play chance in the playoffs. Blame Bettman. You favorite sniper on your fantasy team just missed an open net. Blame Bettman. Your team is over the cap. Dammit Bettman! ...and so it goes for the embattled commissioner of the NHL. Whenever a hockey fan sees something that they don't like, the fall guy is always that diminutive, ex-NBA lawyer, Gary. He's hockey's top exec. He supposedly hates Canada, looks out for only his U.S. based pals, ruined the league by insisting on putting teams in Miami, Atlanta and Nashville, makes up rules to punish the teams he doesn't like, and was/is willing to cheat every other team in the league to help Pittsburgh win the Cup every year. There is also insider rumblings about how this little, evil-genius is planning to make all regular season games into 20 minute-long shoot-outs, with glowing pucks for Prime-time, American (East Coast only) TV audiences! Take a look around the interwebs. You will find examples everywhere of all the horrible things that Commissioner Bettman has done, is doing, or is planning to do. Bear in mind, most of this is all based on misinformation and speculation... but who cares? 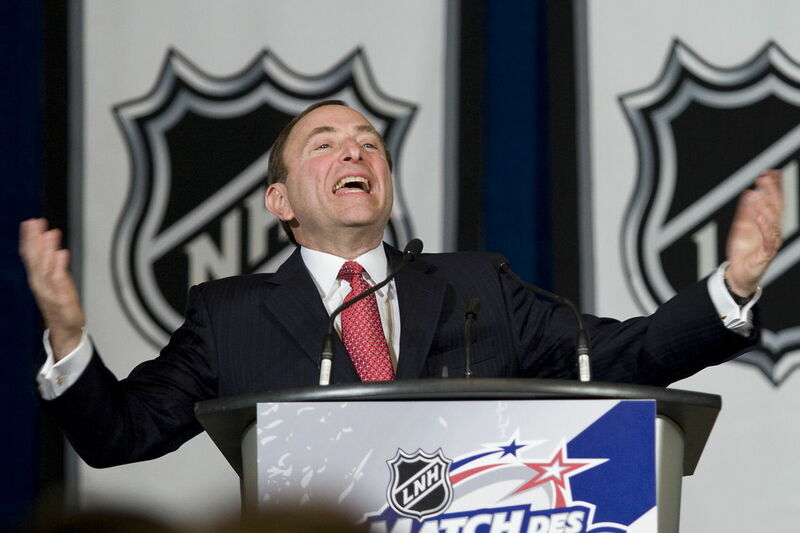 It's Bettman's fault for not being a former player, or Canadian, or something. A prime example can be found courtesy of two very fine sources. Abel to Yzerman via Kukla's Korner, "Well Gary?" Please, please, please don't get me wrong, I read these blogs on a regular basis because they are good stuff. I point it out because I strongly disagree with taking the Commish to the wood shed every time someone gets injured. Knee-on-knee, knee-to-thigh, forehead to lower back. Whatever the case may be, the Franzen/Orpik thing is being ignored by the league. Professional sport’s most inept commissioner has opted to do nothing and the reason he’s made that choice is because it was a Pittsburgh Penguin who attempted to injure a Detroit Red Wing. Is that the truth? It makes no difference whether it is or not because perception is everything in the eyes of the fans. And the fans are the people you continue to alienate Gary. When’s the last time a knee-on-knee wasn’t at least addressed? Why no statement? Why not at least announce that no suspension is in order? Why not tell us that since no video of the incident occurs, an accurate assessment can’t be made? Orpik was given a five-minute major for kneeing Franzen. "It's terrible," Franzen said. "Stupidest play I ever seen. He lifted his foot up and put his knee inside of my leg.... I just put the puck back down deep and was trying to go get it, and he threw his knee out." Orpik's actions did not sit well with Wings forward Todd Bertuzzi, who stood up for Franzen and immediately pounded the Penguin. Bertuzzi picked up 17 minutes in penalties -- five for fighting, two for instigating and a 10-minute misconduct. Franzen, 30, didn't skate today. He said he hoped to skate in the next day or two. Does Orpik deserve to be suspended? Wings coach Mike Babcock wasn't happy about the hit. "I didn't think it was a very good hit," Babcock said. "I don't think they'd be happy if one of our guys did that to Sid (Crosby) or (Evgeni) Malkin. It's one of those things that in the league we like to look after each other's knees." I'm not a doctor but... I am pretty sure that a charley horse is not a knee injury. Therefore I am led to believe that Orpik's knee hit Franzen's thigh, not his knee. "We think more of his thigh, but we'll get him checked out," Red Wings coach Mike Babcock said. "We hope he'd going to be fine." Regardless of what you believe Brooks Orpik's intent to be, the League doesn't have a long history of suspending guys for knee on upper leg shots... nor should they. Can Gary Bettmen catch a break here? Hi, Its a nice blog, I like this blog so much, In fact it is very much comparable to a doctor which has to diagnose a patient based only on the patients interpretation of their symptoms.